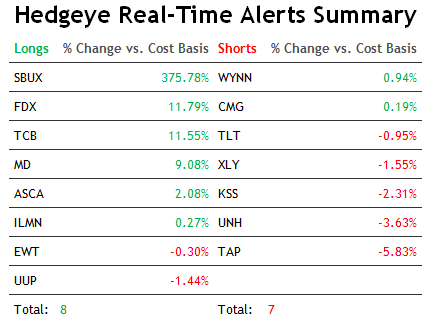 This note was originally published at 8am on January 22, 2013 for Hedgeye subscribers. 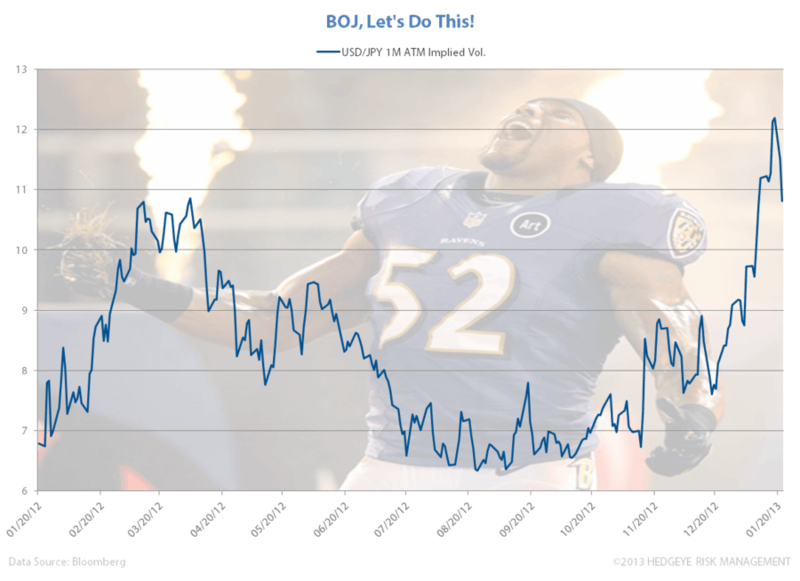 If Japanese policy makers really want to get nuts, they should sign Ray Lewis for the 2014 Money-Printing season. After taking down the Patriots this weekend, the 13x Pro Bowler is going back to the Super Bowl. It’ll be his last game. If Baltimore wins, it will be epic. Yep. 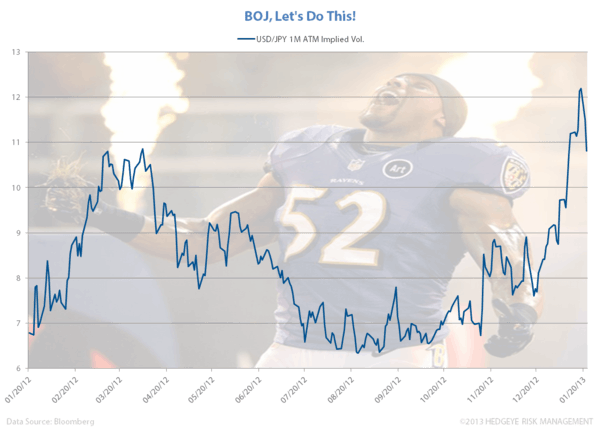 That’s what I am talking about Japan – some ole school Raven rants in those BOJ pressers. Evidently, the global currency market didn’t get the BOJ’s marketing message overnight. The Japanese Yen rallied a full +1% on the “news”, and Japanese stocks snapped immediate-term TRADE support for the first time in months. Isn’t a #QuadrillYen fun? PM Shinzo Abe called the BOJ’s “2% inflation” targeting and asset purchase plan both “bold” and “epoch making.” That might sound like some serious stuff, but the new asset purchases don’t start until January of 2014 – so there’s this little thing called timing that people short the Yen today are getting Taro Aso’d by in the meantime. If you didn’t know the Global Currency War is on, now you know. The Russians and South Koreans talked about it last week, and the President of the Bundesbank (Germany) is calling it out, explicitly, in the FT (Financial Times) this morning. If you want to show the world you are a “different creature”, you’re going to have to one-up The Bernank’s 2012 performance. If what’s bad for a country’s currency is eventually really bad for that country’s real (inflation adjusted) economic growth, the opposite should hold true when a country’s currency stabilizes. What if a stabilizing US Dollar became a strengthening one? How about strengthening the US Dollar +15% (from here) and hammering energy/food inflation next? Didn’t the President of the United States say “we, the people, are all in this together” now? Can you think of a more galvanizing, progressive, and uniquely American marketing message than Strong Dollar = Strong America? I bounced it off the Keynesians in the Romney camp, and they didn’t get it either. But you, The People can get this – Yes You Can! It’s been a while here, folks – but, setting aside the economic disaster that is Japan for a minute, we have the other 3 major global engines no longer stalling/slowing (USA, China, and Germany). That’s better than bad. And so is sentiment. In addition to last week’s -6.7% drop in the VIX, we’re seeing aggregate short interest in US Equities fall fast from their late November highs (that was a bullish signal) at the same time that NYSE Margin Debt rips to the high-end of its 5-year range (perma bulls lever themselves up on the long side at the end of a move trying to chase performance). Our immediate-term Risk Ranges for Gold, Oil, US Dollar Index, USD/YEN, UST 10yr Yield, AAPL, and the SP500 are now $110.75-112.35 (Oil is back above TAIL support, bearish for Consumption), $1654-1692, $79.75-80.17, 88.58-90.61, 1.84-1.91% (Bonds continue to signal #GrowthStabilizing), $482-561 (into Earnings tomorrow), and 1471-1489, respectively.